Book cover art for "An Astronaut's Guide to Life on Earth" by Canadian astronaut Chris Hadfield, to be published Oct. 29, 2013. Canadian astronaut Chris Hadfield, who in May returned from the International Space Station as a veteran commander and social media star, has landed a two-book deal to share his space experiences. In "An Astronaut's Guide to Life on Earth," to be published this fall worldwide by Little, Brown and Company and by Random House Canada in his home country, Hadfield will take his readers "deep into his years of training and space exploration to show how to make the impossible possible." "His own extraordinary education in space has taught him some counterintuitive lessons: don't visualize success, do care what others think, and always sweat the small stuff," the publishers added. The book, which is subtitled "What Going to Space Taught Me About Ingenuity, Determination, and Being Prepared for Anything," will be published on Oct. 29 as a 320-page hardcover and as an eBook. An audio book version of "An Astronaut's Guide to Life on Earth," read by Hadfield, will also be released by Hachette Audio. Chris Hadfield made history as the first Canadian to command a space mission serving as the leader of the space station's Expedition 35 crew. His 144-day stay on board the orbiting outpost marked his third journey into space. Hadfield earlier flew on two NASA space shuttles, Atlantis' STS-74 mission in 1995 and Endeavour's STS-100 flight in 2001. During his second mission, Hadfield became the first Canadian to perform a spacewalk, helping to install on the space station the Canadarm2 robotic arm. It was during his latest expedition however, that Hadfield gained worldwide acclaim for his photos and educational videos about living in space. Posting to Twitter, YouTube and other social media websites, Hadfield shared his daily experiences from orbit and produced several music videos that quickly went viral. A singer and guitar player (on Earth, Hadfield is a member of two bands, including the all-astronaut group "Max Q"), Hadfield's on-orbit rendition of David Bowie's song "Space Oddity" received more than 10 million views during its first three days online. "That Chris Hadfield never lost his sense of wonder for the grand features and quirks of space is obvious to the millions who have watched the videos he beamed back from the International Space Station," John Parsley, Little, Brown's executive editor, said. Anne Collins agreed. 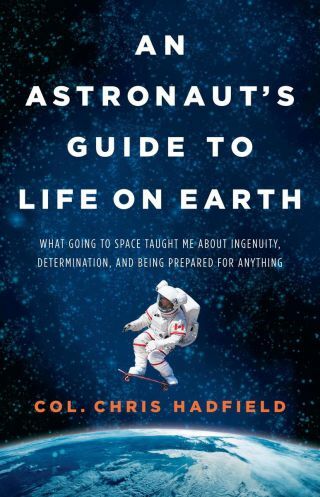 The publisher of the Knopf Random Canada Publishing Group, Collins cited Hadfield's capacity to "bring home the fascinating details of what it takes to be an astronaut and what it's like to live in microgravity." "Imagine what his eloquence, and unique vantage point, will deliver at book length," she added. "Not only has there never been an 'astronaut book' like this one, there has never been another book like this one." "An Astronaut's Guide to Life on Earth" is the first of two books Hadfield will write under an agreement with Random House Canada. The subject and timeframe for the second book was not released. Hadfield is among a handful of now-retired astronauts who are sharing their experiences in books. Seven-time shuttle astronaut Jerry Ross released "Spacewalker: My Journey in Space and Faith as NASA's Record-Setting Frequent Flyer" in January. David Hilmers, a four-time space shuttle mission specialist who made his first flight on the maiden flight of Atlantis, penned "Man on a Mission," a children's book, published in April. Former NASA astronaut Don Thomas' "In the Footsteps of Neil Armstrong and John Glenn," is scheduled for release in October, a few weeks before Hadfield's book arrives on store shelves. Expedition 15 flight engineer Clay Anderson is also writing his biography, tentatively titled "Just Takin' Up Space!" to be published soon.